"Here's our summary of current global Ad CTRs and we give alternative, more recent comparisons later in the post. So, this is just than 5 clicks per 10000 impressions showing the difficulty of driving direct response from online display or banner ads. While this is a really low CTR, however you look at it, cross media optimisation research we have seen show that online ads do help increase brand awareness and purchase intent, particularly when combined with offline media. It's not the case that the majority of ad viewers have 'banner blindness' and are not aware of ads which are viewable placements. If this were the case, businesses wouldn't invest in the level of display and programmatic ads that they do. Tests from the likes of Dynamic Logic and Millward Brown conclusively show that display ads also encourage site visits (viewthroughs) and searches even where people don't click on ads. 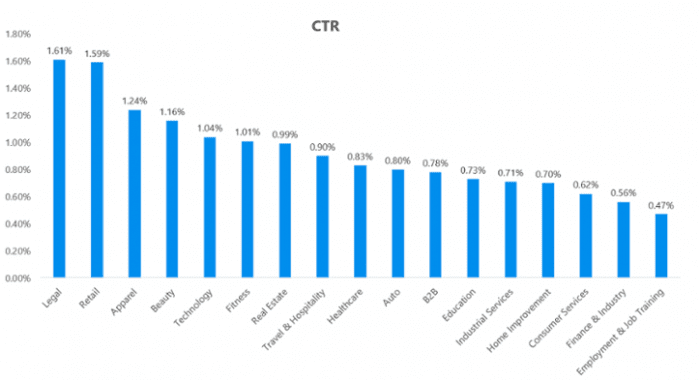 We also see much higher CTRs online for other online ad formats like Google AdWords and Facebook - these can exceed 1%, so are more effective in driving volume and also typically have higher intent, so conversion rates are higher. The new 2018 cross-industry Google Ads clickthrough rate and conversion benchmarks gives data on Google Ads display ad network which is typically an image or text-based banner format. 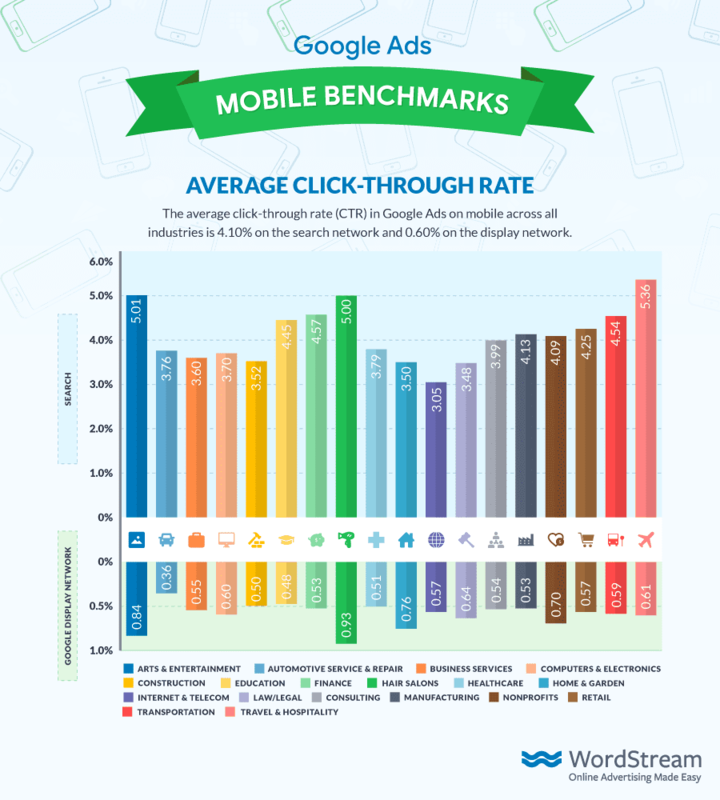 The average click-through rate in Google Ads on mobile across all industries is 4.10% on the search network and 0.60% on the display network. It's no surprise that the CTR on the search network is much higher than in the display network since in the search network, searchers are typing in product and brand names when they have specific intent so the ads are more relevant. This isn't the case in the display network where they are responding to banner and text ads, typically on publisher sites. Here are the results from 18 industries which could be useful if you are a startup modelling conversion rates as part of a business plan, or if you want a top-level comparison for your activities with others in your industry. Of course, the outcome that is measured as conversion rate will vary according to sector and depending on the type of keyword, brand searches always have higher clickthrough and conversion rates than generic searches, for example. For retail, the outcome will be conversion to sale, but in many other sectors show, the conversion will be conversion to lead. Across standard and rich media, this shows an ad clickthrough rate of 0.14% which is more realistic estimate if ads will be placed on the fold. For Smart Insights advertisers we offer an MPU in the right sidebar above-the-fold and this has a typical CTR of 0.15 to 0.22% depending on the creative and content asset on offer. This chart, also from Google-Doubleclick shows that the 0.1% CTR has been an average for some time although the recent fluctuations cast doubt on the data accuracy. For anyone researching trends in display advertising in different countries or sectors you could try the Doubleclick Ad Research page - these reports don't tend to be updated so frequently though. 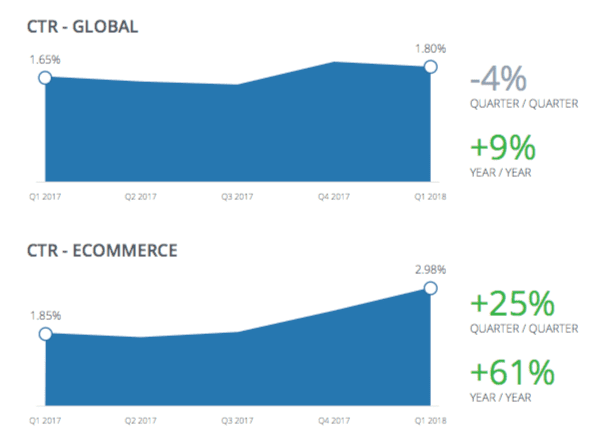 Recent changes in Facebook CTRs from a Nanigans Q1 2018 Facebook advertising benchmarks show response rates moving upward for ecommerce marketers even after increasing in Q4. The average Q1 2018 CTR of 2.98% in Q1 is 25% higher quarter-over-quarter and 61% higher year- over-year. This is at a similar cost of $10.24 CPM, a quarterly decrease of 2%. Average CPCs are $0.34 in retail. Further breakdowns aren't given for ad type. Wordstream have posted an interesting analysis comparing Facebook and Twitter. It's generally known that Facebook has low CTRs because ad units are not that prominent - it's similar with LinkedIn. Although this is changing as more prominent ad units are created, particularly on mobile. 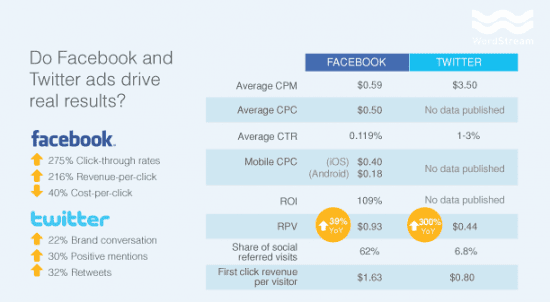 You can read the full analysis from Larry Kim on Facebook vs Twitter CTRs on Wordstream which includes a wider analysis of the importance of their advertising including mobile. 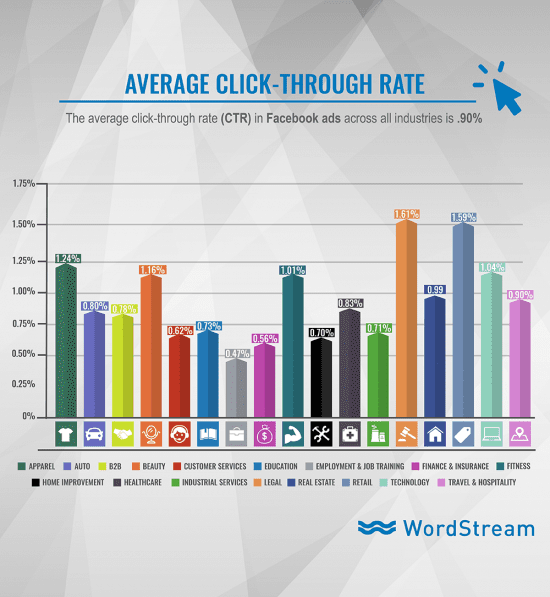 There is also newer 2017 research Facebook Ad CTR from WordStream's Facebook advertising customers showing that across sectors clickthrough rates (CTRs) vary from around 0.5% through to 1.6%. These statistics are courtesy of the Adobe Digital Index reports, published annually for their customers across 200 billion site visits. 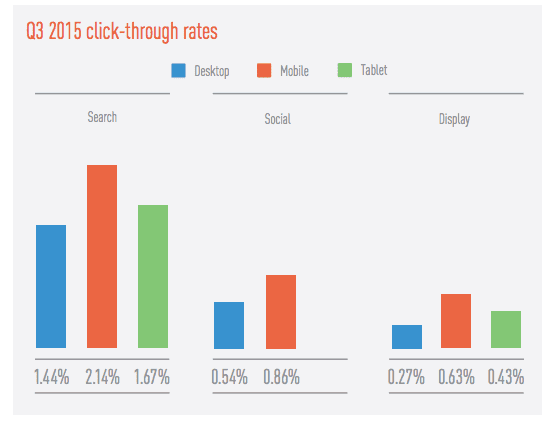 Of course, these figures are averages and in reality, CTRs tend to be higher for brand searches. 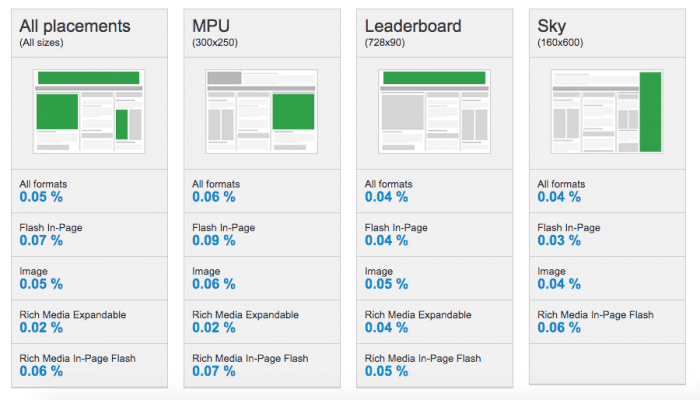 We also have a comparison of Google Clickthrough rates by position. This comparison of average online media clickthrough rates from Marin is useful for modelling the response of digital media for top-level budgets. Facebook offers different forms of ad formats with different goals will naturally vary in response as these retail Facebook ads from. 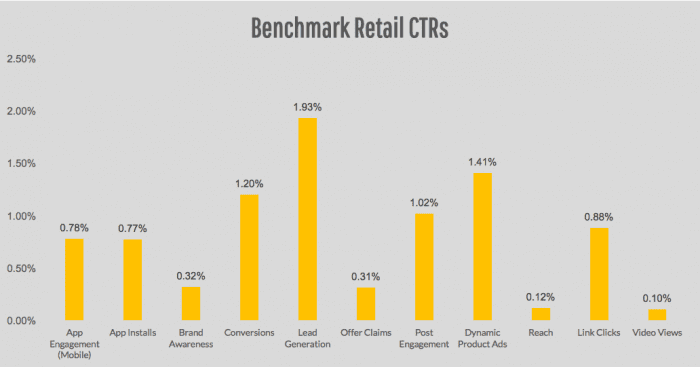 You can see that Facebook ad CTRs which may be more highly targeted that display ads have significantly higher CTRs, particularly for Lead generation (i.e. adding subscribers to a retailers email list) and Dynamic Product ads (retargeting visitors who have already visited a site with relevant offers). These Facebook Ad CTRs for different types of ad formats are taken from a test run by Smart Insights contributor Marie Page. They show that by using targeting in Facebook it's possible to improve on general Internet ad clickthough rates. 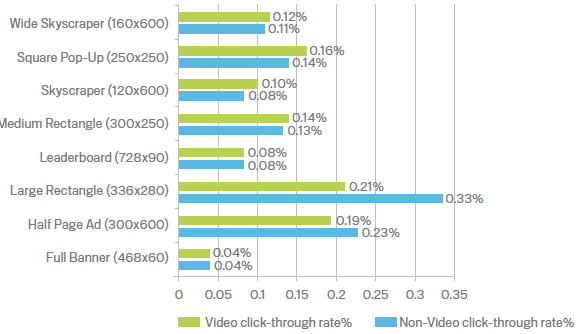 Viewability is another issue for advertisers to consider when evaluating online ad effectiveness as measured by clickthrough rates. Ad blocking also has an impact since ad blockers have increased in popularity across countries and demographics, accounting for 35% of ads in some countries. Viewability refers to the percentage of ads in a campaign or on a publisher site that are potentially available for clickthrough. Just 44.9% of all ads are clickable according to Google-published viewability data since ads may be below the fold and users do not scroll to see them. This varies across publisher and content category. Given the impact of viewability and ad blocking on online ad clickthrough rates you can see that there are moves in the industry to only charge for viewable ads, which with increasing options for native advertising will potentially improve the effectiveness of ads. This is historic data for reference - for the latest use the interactive Display benchmarking tool. 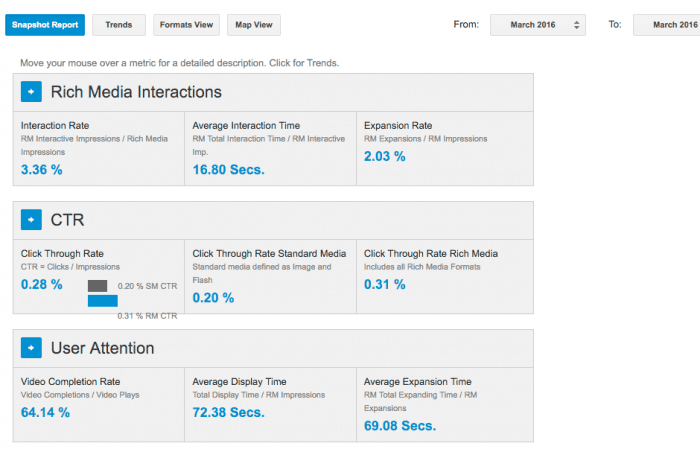 For latest data see Doubleclick Display Ad Benchmark Statistics. 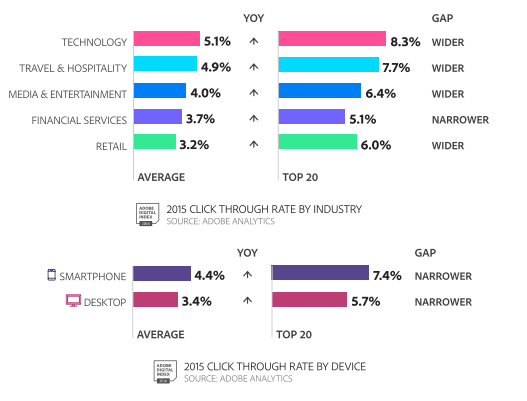 Ad clickthrough rate naturally varies according to placement (position on screen) and ad format (shape and size). The traditional full-banner performs very poorly compared to skyscrapers, the ubiquitous medium rectangle and the newer large rectangle format. 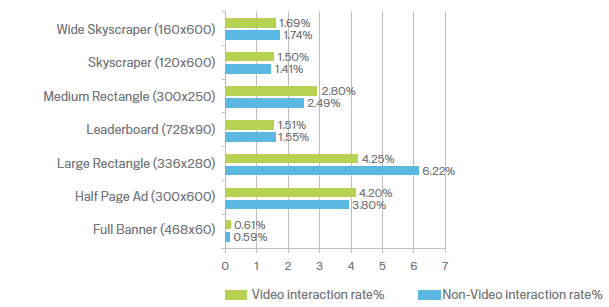 Interaction rates differ for different ad formats in a similar way to ad formats.